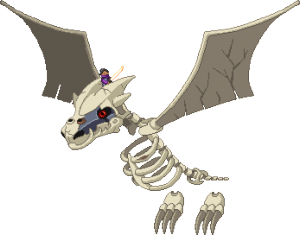 The Bone Dragon is a boss encountered close to the end of the mission, the Baron's Keep. While fighting the Dragon, it will descend and flap its wings wildly making its hit box very hard to see. It shoots a stream of fireballs from its mouth which explode on contact with a surface and leave flames on the ground that can damage players. This attack does not destroy blocks but the explosion can damage players through walls making it more difficult to exploit the wall mechanics. The Bone Dragon will hover and follow the player throughout the map, shooting a large fireball that spreads fire in an area on impact. Should the player retreat outside the castle's gate, it can destroy the tower's blocks with its fireball and continue pursuing the player. In addition, groups of cultist infantry will teleport to the outside of the castle and join the fray. The Bone Dragon telegraphs its fireball by pivoting its head towards the player; the attack is easily dodged with an energy dash, but one must care not to dash into the resulting fire patch or into one placed by a previous fireball. For the most part, the Bone Dragon will hover in place near the player, launching a single fireball once every couple of seconds, allowing the player to continue damaging it or deal with the additional cultists between fireballs. A Ferozium Staff works wonders on this boss, as its large hitbox allows for all 5 projectiles to hit as soon as they appear, dealing enormous damage and minimizing the time between spells. Melee users should be cautious while jumping to attack the Bone Dragon, as being closer to it decreases the time in which to dodge its fireballs. If the Bone dragon needs to get past a wall, for example the tower, it will shoot off streams of fireballs until it breaks through. This can be exploited by standing against the cliff to the right of the battlefield. In an attempt to reach the area above you, the Bone Dragon will attempt to destroy the cliff. However, the cliff cannot be destroyed, so the dragon is permanently locked into firing shots at the wall, allowing you to focus on avoiding the cultists. This page was last modified on 26 September 2017, at 04:42.